Financial Preparedness Friday’s will be articles that combine a ‘What Can I Do Today?’ with a more detailed look at a financial topic or question. So today’s ‘What Can I Do Today’ is: If you are currently working, and are employed at a company that has a 401(k) and you are not signed up, call the Benefits department today and get the paperwork to join. If your company offers a dollar match in your 401(k) and you are not taking advantage of it, you are not participating in what could by the highest return percentage available to you. If you are in your companies 401(k) and you are not getting the maximum match, increase your contribution percentage until you are getting the maximum match. And if you are already contibuting to get your maximum match, congratulations! Now take it one step further and raise your percentage by 1%. If you say you can’t afford it, my response is that you can’t afford not to do it. Take a look at the above image. 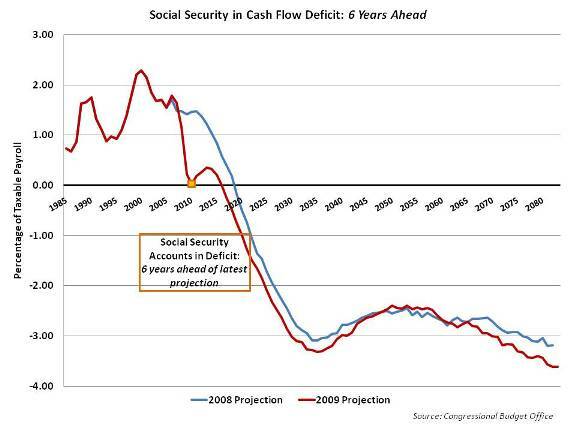 It shows that Social Security is currently in the red, many years before almost anyone predicted. That means that Social Security, today, is now spending more money than it takes in. If you are relying on Social Security to assist you in your old age, don’t. Being prepared means being financially prepared to take care of yourself without depending on anyone. I absolutely understand it is challenging to put money away in a very difficult economy, but I implore you to make saving at least a little bit the first thing you spend your money on (the 2nd if you tithe), not the last. For those working hourly jobs without access to a 401(k), I’ll let you know a little method that literally changed my life, with little effort. I’ll warn you though, you will need some willpower. In 1999, my life, financially and otherwise, was a train wreck. I was unemployed, I smoked 3 packs of cigarettes a day when I could afford it, drank too much beer, and otherwise was on a self-destructive path. I had $43,000 in credit card debt and another $3,000 in student loan debt. When I say I know how bad it can get, I do. In late 1999 I filed bankruptcy. While I believe in paying my debts, at that point in my life I just had no idea how that was possible. I was making $8 an hour, and I couldn’t even afford minimum payments on my debt, let alone extra to pay down principal. However, it was after the bankruptcy when the most difficult choice appeared. Within 2 years of my bankruptcy, credit card companies were offering me credit again. I actually opened 2 credit lines, and very quickly found myself staring at $2500 in credit card debt. One day I looked at myself in the mirror and couldn’t stand what I saw. What I saw was a complete and utter lack of control over my own life. And it was that day I took a stand. I called and cancelled one card, and hid the other one and swore I would use it in emergencies only. And while I can hardly believe it now, I stuck with it. I paid off the credit cards by 2004, paid off my student loan about the same time, and started on my sometimes-rocky financial recovery. So how did I manage it? From my first day of work, even when I didn’t know why, I always paid myself first. When I first got the job for the company I am still working for and was only making $8/hour, I put $10 a week into an envelope. It was the first thing I did with every paycheck. It wasn’t a lot of money, and I couldn’t really imagine that I would ever save any real money that way. But what it did was more psychological than financial. It gave me peace of mind. When a water pump blew on my car, I usually somehow had just enough in my evelope to cover it. When I had to have insurance or risk driving without, the envelope usually helped me with the last $50 or $60. When I wanted to take a pretty girl out on a date, I thought that was an emergency too and usually raided $40. Before I knew who Dave Ramsey was, I had created my own emergency fund. When I got a raise at work, I increased the amount I put in the envelope from $10 to $20 per week. If I did an odd job or sold something on eBay (something I did more and more as time went on), I put a portion into the envelope. There were some weeks when I would have $800 or more in the envelope, and others where it was near empty, but I never skipped a week or made excuses why I couldn’t put some amount of money in it. Eventually I even used a good chunk of ‘envelope money’ to pay off my credit cards and start a debt-free lifestyle. Today I challenge you, no matter what your current financial status, to stretch and take one small extra step. As I have said, I will be doing anything I ask you to do. After I post this article, I will be increasing my 401(k) contribution from 5 to 6%. (my match is 5%) I hope y’all will do the same. So whether it is putting $5 in an envelope or saving some of your birthday money instead of spending it, I guarantee there will come a time in your life when you will be glad you did. posted in Frugality, What Can I Do Today? ← What Can I Do Today? Document Edition.